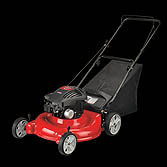 This is a 21" push mower. It comes with an optional mulch kit and rear bag to make clean up a ton easier. It comes with a 158CC Briggs and Stratton Quattro engine and features a 9 position height adjuster. We bought this lawn mower because our new landlords asked us to maintain the lawn where we live. We had no previous buying experience for lawn care products but were pleasantly surprised. It is so easy to use. I didn't even have to read the instructions before using it. I picked it right up and my husband was impressed that I actually mowed the lawn for him. The removable bag on the bag is very convenient since we have pet chickens who love to eat grass clippings. I just take off the bag after I've mowed and dump it in the back yard for them to munch on. We bought ours from Home Depot since they usually have a large selection to choose from. No one helped us but they did have a wall chart that compared all of their models and brands. We picked this one for the ease of use and the bag function. I believe we spent $197 on it and it was on sale at the time. We've had it for about 6 months now and have had no problems. I didn't buy a cover or any other kind of protection for it because we just keep it on the back patio under the awning. It gets dirty still and the chickens like to perch on it but it still runs great with not a single problem. We love it!